The Roman Empire began to slowly decline in the 3rd century AD, one of the main causes of Rome's early decline was a series of plagues, most notably the Plague of Cyprian, which decimated the population of the Empire, making it harder for Roman Emperors to levy armies and raise taxes. In the 4th and 5th Centuries AD, nomadic peoples from Central Asia began to migrate out from their homeland and cause considerable havoc all over the Eurasian Continent. One of these groups were the Huns, who arrived in Europe at about 370 AD. The arrival of the Huns in Europe immediately caused a great involuntary movement amongst the Germanic peoples who, centuries earlier, had moved down from Scandinavia and were settled on the northern fringes of the Roman Empire. These Germanic peoples were forced out of their homelands and penetrated into the Mediterranean World, sometimes settling peacefully, sometimes raiding Roman cities and sometimes offering their services as mercenaries to defend Roman cities against other barbarian invaders. The Visigoths were one of the first groups to arrive, sweeping through the Balkans, defeating a large Roman Army at the Battle of Adrianople in 378 AD and then migrating into Italy and sacking Rome itself in 410 AD, before finally establishing a Kingdom in the area of Aquitania. Other Germanic groups soon followed, such as the Vandals who swept through Western Europe and into Africa where they conquered Carthage and established a kingdom there. (See map 2) Germanic invasions seemed relentless, the Angles and Saxons swept into Britain, forcing Rome to abandon the island in 410 AD, the Franks took control of all of Gaul, and the Ostrogoths conquered Italy. 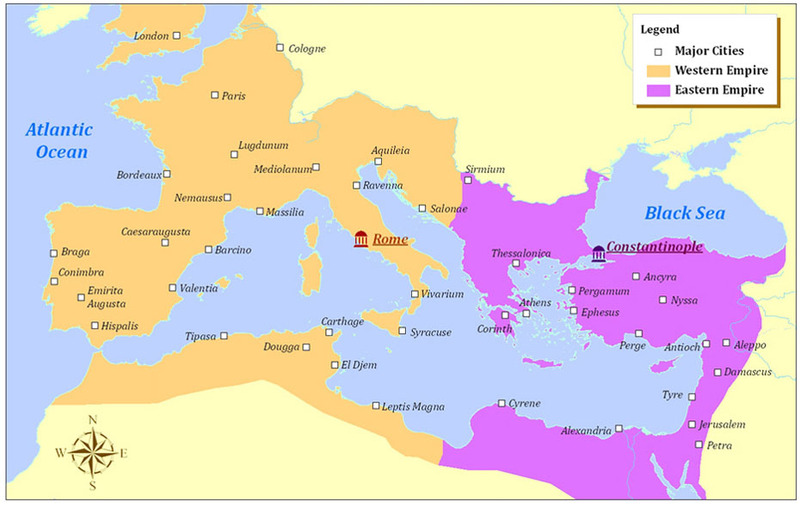 (See map 3) By 500 AD, the Western Roman Empire was no more, having been replaced by a number of Germanic Kingdoms. (See map 4) The Eastern Roman Empire was still intact however and would survive for another thousand years as the Byzantine Empire.